Ghee can be used in place of butter and is an ideal cooking oil, as it does not burn unless heated excessively. Ghee is a digestive. It helps to improve absorption and assimilation. It is good for improving memory and lubricates the connective tissue. 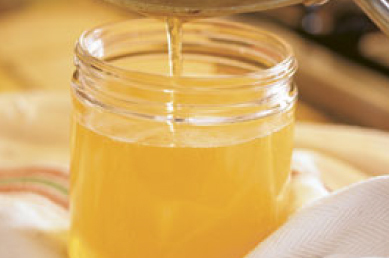 Ghee makes the body flexible and, in small doses, is tridoshic. Ghee is a yogavahi—a catalytic agent that carries the medicinal properties of herbs into the seven dhatus or tissues of the body. Ghee pacifies pitta and vata and is acceptable, in moderation, for kapha. Persons who already have high cholesterol or suffer from obesity should be cautious in using ghee. Ghee is not to be used when there are high ama (toxic) conditions. Turn down the heat until the butter just boils and continue to cook at this heat. Do not cover the pot. The butter will foam and sputter while it cooks. Whitish curds will begin to form on the bottom of the pot. The butter will begin to smell like popcorn after a while and turn a lovely golden color. Keep a close watch on the ghee, as it can easily burn. After a while it will become a clear, golden color. You will have to take a clean, dry spoon to move away some of the foam on top in order to see if the ghee is clear all the way through to the bottom. When it is clear and has stopped sputtering and making noise, then it needs to be taken off the heat. Let it cool until just warm. Pour it through a fine sieve or layers of cheesecloth into a clean, dry glass container with a tight lid. Discard the curds at the bottom of the saucepan. The ghee is burned if it has a nutty smell and is slightly brown.